Potassium homeostasis is achieved through balancing dietary potassium intake, intracellular and extracellular potassium levels and excretion by the kidneys. Extracellular potassium is usually maintained within 3.5 to 5 mmol/L. This narrow window of control is critically important as the difference between the intracellular and extracellular potassium affects electrically excitable muscle and nerve cells due to its effect on the resting membrane potential. Intracellular potassium levels, which are maintained within 120-150mmol/L, are important for enzyme function, cell division and growth. It also contributes to acid base and cell volume regulation. This article focuses on the external balance of potassium within the body. Excretion of potassium is controlled by regulating potassium secretion and potassium reabsorption. This is done by the kidneys to match the potassium intake and maintain homeostasis. Potassium is freely filtered at the glomerulus and passes through to the proximal convoluted tubule and loop of Henle where most of it is reabsorbed. There is some reabsorption of potassium in the distal convoluted tubule and collecting duct, but potassium secretion also occurs at these sites. The freely filtered potassium is then passed through the kidney tubules. 67% of the filtered K+ is reabsorbed in the proximal tubule and approximately 20% is reabsorbed in the thick ascending limb of the Loop of Henle. This means a very small proportion of K+ reaches the distal nephron. K+ reabsorption is primarily passive within the PCT and roughly 67% is reabsorbed in this section of the nephron. It occurs via a paracellular mechanism and is directly proportional to water and Na+ movement. The Na+-K+-ATPase causes sodium to move out of the proximal tubule cell and drives potassium into the cell. The extrusion of sodium creates an osmotic gradient and an electrochemical gradient. Water moves out of the PCT down the osmotic gradient created by sodium and Cl– moves down the electrochemical gradient. K+ is reabsorbed and follows Cl- into the bloodstream. In this section of the nephron roughly 20% of K+ is reabsorbed and it occurs via transcellular and paracellular pathways. Na+-K+-ATPase on the basolateral membrane pumps Na+ out into the bloodstream and pumps K+ into the thick ascending limb which keeps the sodium concentration in the cell low. This creates a gradient for NKCC2 cotransporter on the apical membrane to pump Na+, K+ and 2 Cl- into the cell from the lumen. From the cell, K+ can enter the bloodstream through K+-Cl- cotransporter or through the K+ uniporter. Movement of K+ through apical ROMK channels leads to a positive voltage in the lumen which provides a driving force for the passive reabsorption of K+. Around 10-12% of filtered potassium is reabsorbed here when the body is attempting to preserve potassium. It occurs via the transcellular pathway and is mediated by alpha and beta intercalated cells. Structurally, the initial collecting tubule and cortical collecting duct are both composed of 70% principal cells (secretion of K+) and 30% intercalated cells (reabsorption of K+). In this section, we are considering the intercalated cells in the reabsorption of K+. The apical H+-K+-ATPase mediates the movement of H+ out into the lumen, driving K+ into the intercalated cell. Then, the basolateral K+ channel allows the K+ building up in the intercalated cell to leak out into the bloodstream. In potassium depletion, the number of H+-K+-ATPase pumps increase significantly in order to reabsorb as much K+ as possible. However, reabsorbing K+ drives H+ secretion into the lumen. This leads to hypokalaemic alkalosis. Potassium secretion occurs mainly in the late distal collecting tubule and the collecting duct. The purpose of secretion is to control the serum potassium levels in the long term. The rate of secretion is variable and can be increased or decreased due to several factors which will be considered later in the article. With a normal or high K+ diet, the substantial secretion varies between 15-120%. However, with a low K+ diet or depletion, there is very little secretion. Potassium secretion in the late DCT and collecting duct is mediated via principal cells and the rate can be varied depending on need. The principal cells of the late DCT and collecting duct contain ENaC on the apical membrane and Na+-K+-ATPase on the basolateral membrane. The activity of Na+-K+-ATPase results in Na+ moving out into the blood from the principal cell and in turn drives K+ into the principal cell from the bloodstream. This leads to a decrease in intracellular Na+ concentration and an accumulation of intracellular K+. The high intracellular K+ in comparison to the luminal K+ concentration creates a chemical gradient which is ideal for potassium secretion from the principal cell into the lumen. Due to the action of Na+-K+-ATPase, the low intracellular Na+ concentration allows for a concentration gradient between the lumen and principal cell. Na+ moves from the lumen into the cell down the concentration gradient through ENaC. This creates a favourable electrochemical gradient which allows for K+ secretion via the K+ channels on the apical membrane. High ECF [K+] – This stimulates the Na+-K+-ATPase, leading to increased permeability of K+ channels on the apical membrane. This results in increased secretion of K+ into the lumen. Aldosterone – This stimulates the Na+-K+-ATPase channels in the basolateral membrane. This stimulates K+ channels and ENaCs in the apical membrane, leading to increased K+ secretion. Due to H+-K+-ATPase, when H+ is secreted into lumen, K+ is driven back into the cell, leading to decreased K+ secretion. Stimulates Na+-K+-ATPase, leading to increased K+ channel permeability. High luminal flow – The increased flow rate washes away luminal K+ meaning that there is a constant concentration gradient available. This leads to increased K+ secretion. This increased luminal flow also increases Na+ delivery to the tubule cells which stimulates Na+ uptake through ENaC. This leaves the lumen in a negative potential, encouraging K+ to be secreted through the apical K+ channel. Hypokalaemia is defined as [K+] < 3.5mmol/L. This usually occurs due to a disruption of internal balance or increased renal excretion of potassium. Excessive loss of Potassium through either renal or non-renal losses. Non-renal causes include diarrhoea, vomiting and bulimia. Renal causes include diuretics, osmotic diuresis (as a result of uncontrolled diabetes) and mineralocorticoid excess. The first step in treatment is to identify the cause and treat it. Following this potassium should be replaced either via the oral or IV route. If the cause is excess mineralocorticoids then K+ sparing diuretics should be given. 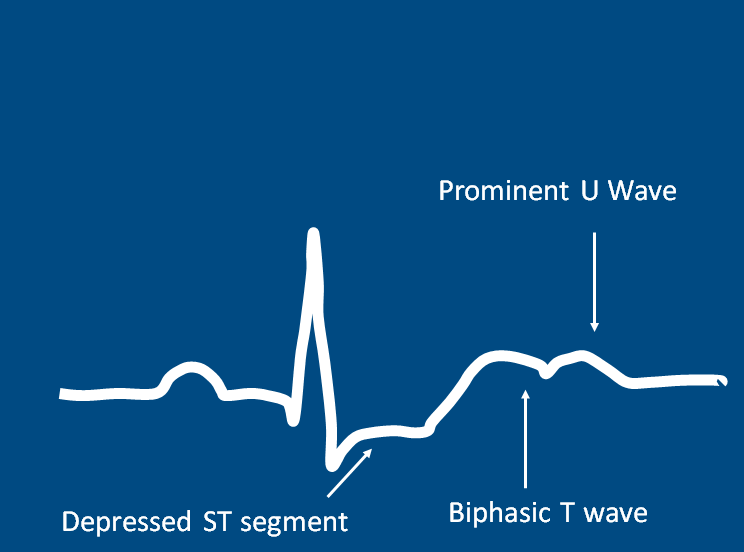 Fig 3.0 – ECG changes seen in hypokalaemia. Where is most potassium reabsorbed in the kidney? Which channel is mainly responsible for reabsorption of Potassium from the lumen into the cell in the thick ascending limb? Which channel is mainly responsible for reabsorption of Potassium from the lumen into the cell in the distal convoluted tubule? Which channel is mainly responsible for the transportation of potassium ions into the cell from the bloodstream in the late distal convoluted tubule and collecting duct? Which of these factors would increase secretion of potassium ions?